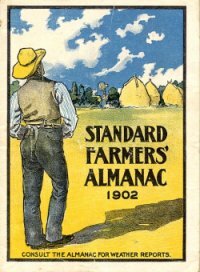 The editor of the 1902 Old Farmers Almanac was kind enough to share an energy saving tip that was sure to save the average home a fortune in home heating costs. The trick was to toss your log out a two story window, run to get said log, quickly make your way back up the stairs and repeat the procedure. If you're the type that enjoys this kind of twisted humor then perhaps you might want to check out the new online version of this famous almanac. This year's version of the Old Farmers Almanac is predicting cooler than normal temperatures for this winter and suggests we are in for a 50 year cycle of colder winters. Predictions are made at the almanac from a complex and secret formula devised by Robert B. Thomas in 1792 that takes into account sun spot activity and other solar events. Their results are almost always close to 80 percent accurate, which makes it worth checking out in my opinion.